I'm having so much fun with my sister Lindsay. THE artist in San Francisco. SO yesterday we went to get some yummy sushi at Sake. I got the Izey Ro(ll). Just as I expected it would taste. More about our sisterly adventures to come. I would for sure eat some of that sushi! That is hilarious! 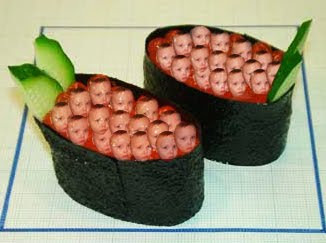 I want me some Izey roll!